“You never go on a review with two other people, do you?” said Reggie as he, Claire and I took our seats at Pho. I’d been due to go on duty just with Reggie, but Claire and I were having a quick drink after work when Reggie came to join me and we had one of those “let’s put on the show right here” moments. Looking across at my two friends, side by side like an interview panel, I realised that they might well spend much of the evening taking the piss out of me. Oh well, at least I’d get to try more starters. Reggie smiled. “Three people, I like it. It might be a bit quirky.” Reggie is a big fan of Tony Blair and, like Tony Blair, I sometimes think he’s a little too worried about his legacy. Claire did a face I recognise, where she looked like she was rolling her eyes without actually doing so: it’s a neat trick, if you can manage it. I resolved to write a review as lacking in quirks as possible: that’ll teach him, I thought. The inside of Pho is very nicely done indeed. You wouldn’t ever know it was once one of Reading’s many Burger Kings – inside it’s all dark wood and muted lighting, with big wicker shades hanging from the ceiling. The furniture, despite playing to the usual school chair trope, looks comfy enough to linger in and the bigger oval tables at the back of the restaurant seemed perfect for larger groups (nice, too, to see some tables outside – I can see that on hotter days that could be lovely). We were in one of the booths in the middle section of the restaurant and very pleasant it was too, easily large enough for four rather than the squeeze it can be at, say, CAU. A waitress came over and asked if we’d been to Pho before, and given our mixed response she kindly explained the menu to us. It didn’t really take much explaining – certainly not enough to need to make a thing of it, anyway. There were starters, salads, rice dishes, noodle dishes and of course the pho (pronounced “fuh” rather than the name of the restaurant, which is pronounced “foe” – got that? ), the traditional Vietnamese dish of soup and noodles which takes up much of the menu. The horse trading began fairly straightforwardly – we agreed to share three starters, and picked two Claire had already tried and one Claire hadn’t (Claire, as she pointed out to us, had been to Pho many times). It became more difficult when we got to the mains. “But should I have the pho too, or should I have a rice dish? I really fancy the rice dish, but is it like having the Prego steak roll in Nando’s?” said Reggie. That legacy thing again. Normally, I would be saying how great it was that a menu provided you with such tough choices – with any other dining companion, anyway, but I suspect this is just Reggie. He changed his mind another couple of times before our waiter turned up, and even when he did I half expected poor Reggie to toss a coin. Our waiter was friendly and likeable and talked us through the options, congratulated some of us on our choices, recommended beers, the whole shebang. He was really very good. “I could tell you had a problem with that” said Reggie, who does enjoy the fact that I’m nearly twenty years older than him. “You visibly tensed up.” Well, it’s possible. I also had a problem with the fact that our beers – Saigon for me, Ha Noi for Reggie – turned up without glasses, but I felt too old and fuddy-duddy to ask for one. Besides, I was wishing I’d had a coffee martini like Claire’s – sweet with condensed milk, it was more like a White Russian than a martini. More than a sip of hers, and the regret would have been too much. Our starters arrived quicker than I’d personally have liked, but they all looked nice enough. The goi cuon, summer rolls with chicken, were light, delicate things; rice paper parcels mainly filled with shredded vegetables and vermicelli noodles, a thin strip of chicken along one edge. You dipped them in the nuoc cham, a slightly anonymous sweet dipping sauce with, allegedly, fish sauce and lime in it. Reggie and I used our hands while Claire, just to show us up I suspect, deftly wielded chopsticks. They liked the summer rolls more than I did – I thought they showed how fine the line can be between subtle and bland. “They’re especially good in the summer. Well, obviously” said Claire. Nem nuong, it turns out, are Vietnamese meatballs rather than that odd looking mouse with jowls from Return Of The Jedi. These were more my sort of thing – six sizeable spheres of coarse meat on skewers. They were pork and lemongrass, although I didn’t get as much of the latter as I’d have wanted. You were encouraged to wrap them in lettuce and dip them in the peanut sauce, but there wasn’t quite enough lettuce to easily do that and although I loved the peanut sauce it did rather obliterate your hopes of tasting much else. I liked this dish more than Reggie and Claire did, which makes me wonder if they, with their more refined palates, should have written this review instead of me. The last of our starters was muc chien gion, fried baby squid. This came with a bit of self-assembly – a little dish with pepper and chilli which you squeezed half a lime into, mixing it with chopsticks to make a dip. This was a lot of fun, although it didn’t make much dip; perhaps more than half a lime was called for. As for the squid, I thought it didn’t seem like an awful lot for seven pounds. What there was I quite enjoyed, although it was wayward – some of it was very intensely seasoned, some not at all. Baby squid was about right, too – much of it seemed to be shrapnel, which tested our chopstick skills. Well, everybody’s except Claire’s. Opinion was divided on which starter was the best. Reggie and Claire favoured the squid, I preferred the meatballs. Perhaps most tellingly, the summer roll had come in four bits and there wasn’t a pitched battle for the spare quarter. While we waited for the mains to turn up Reggie and Claire settled on their favourite conversational topic, which seemed to be critiquing previous reviews I’d written and saying that the rating didn’t match the write-up. It was part-meal, part-audit. Our main courses, again, came relatively quickly. I’d gone for the pho dac biet, a sort of greatest hits with chicken, prawns and garlicky beef. It came with a side plate of optional garnishes – beansprouts, mint and coriander, chilli and lime. I expected pho to be hard work to eat, and it was: you desperately try to fish out the floppy noodles, with chopsticks, using the big flat wooden spoon as a platform to make it easier. Then you use the spoon to sip the broth. Couldn’t be simpler, you might think, but I managed to make it incredibly complicated. Throughout the whole thing I found myself thinking that if everything was tastier the experience would have been more than worth the faff, but again I found the dish understated almost to the point of being silent. The steak, what there was of it, had genuine flavour and the prawns were big firm things. The chicken seemed to be exactly the same as that in the summer rolls, just pale white featureless protein. But the broth, which I’d anticipated so keenly, didn’t have the kind of warmth, depth or complexity I was so looking forward to. As for the noodles, let’s not go there. I left a fair amount, mainly because I was a bit bored of wearing my dinner by then. It’s rare for me not to finish food, and that perhaps tells its own story. Claire told me I should pep up my pho with some of the gubbins on the table: well, in the immortal words of GetReading, “there are plenty of condiments on offer”. I slugged in a bit of fish sauce, stopping shy of the sriracha or chilli paste. I might have had some of the garlic vinegar, but Reggie – in an inexplicable fit of clumsiness – had managed to dish it up all over his trousers, practically a whole jar of the stuff. (“Don’t write about that. You’re going to write about that aren’t you?” he said: umm, yes Reggie, I am.) Maybe I didn’t enter into the spirit of things, but I expected it to taste more interesting before I added stuff to it. I’m sure this is a cultural thing: after all, in most Western restaurants they don’t actively encourage you to season your own food. Claire had ordered better than me, going for the bun bo hue, a spicier soup with slow-cooked brisket and extra chilli paste on the side. It looked the part – brick-red and oily, with lots of strands of beef, and the heat in it was much more interesting. I’m still not sure I would have ordered it, or that I’d have enjoyed a whole bowl of the stuff, but it made an interesting contrast to mine. Actually, it tasted like mine with the contrast dialled up. “I should have had the pho, shouldn’t I?” said Reggie. His dish – com tam dac biet, or broken rice with chicken – looked good, and the chicken thigh was nicely cooked and tasty, the tiny mouthful I grabbed with chopsticks oversold the dish. I got all the best of it in that mouthful but the chicken ran out fast and there was a lot of bland rice underneath to wade through. No wonder Reggie reached for, and ended up bathing in, the garlic vinegar. “This room is so lovely that I always like it here, but I always want to like the food more than I do,” said Claire as we finished our drinks. Our bowls had been taken away and I wondered what was on the dessert menu and whether anything would tempt us to stay. I had half a mind to try the Vietnamese coffee having been told by friends that it was the kind of sweet milky delight I enjoy (the main reason I’ll never make a coffee connoisseur). “It’s very solid, I mean it’s nicely done. The room and everything,” said Reggie, who knows a bit about this sort of thing. “But where have all the staff gone?” I said. Claire was right, and in the time we sat there left unattended we went from “let’s have another drink and look at the dessert menu” to “let’s have a look at the dessert menu” to “sod this for a game of soldiers, let’s pay up and go to the Alehouse”. It was a week night, and the restaurant wasn’t busy; there were staff, but they just didn’t show any interest in coming to our table. All very odd. The meal for three came to sixty-two pounds, not including tip. The Alehouse had a very pleasing booth waiting for us, my cider was cold and fresh and, if anything, Reggie’s trousers smelled even funkier in a more confined space. When we compared notes, our provisional ratings were all in the same ball park. Reggie liked it the least, although you might be able to put that down to his whiffy trousers (or, to use the technical term, “jeans Kiev”), and Claire the most, which might come down to her having been to Vietnam and actually being able to use chopsticks. I was in the middle: wanting to like the restaurant, loving the space, being frustrated by the service. But, worst of all, I was underwhelmed by the food. 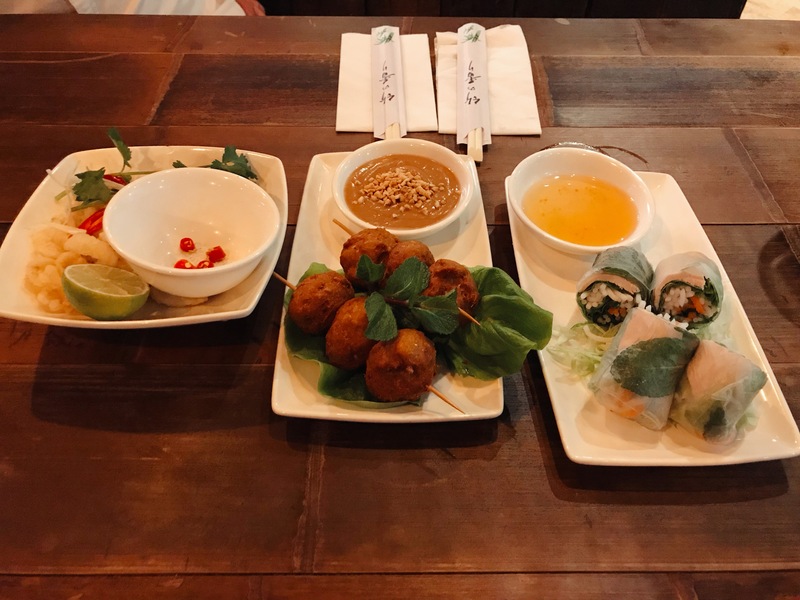 I’ve had Vietnamese food before, at a place in Glasgow called Hanoi Bike Shop, and it blew me away; everything sang and zinged with flavours I’d never experienced and yes, it was all clean but never anodyne. Pho didn’t come close to that. Not for the first time in nearly five years of doing this gig, I wondered what I was missing. 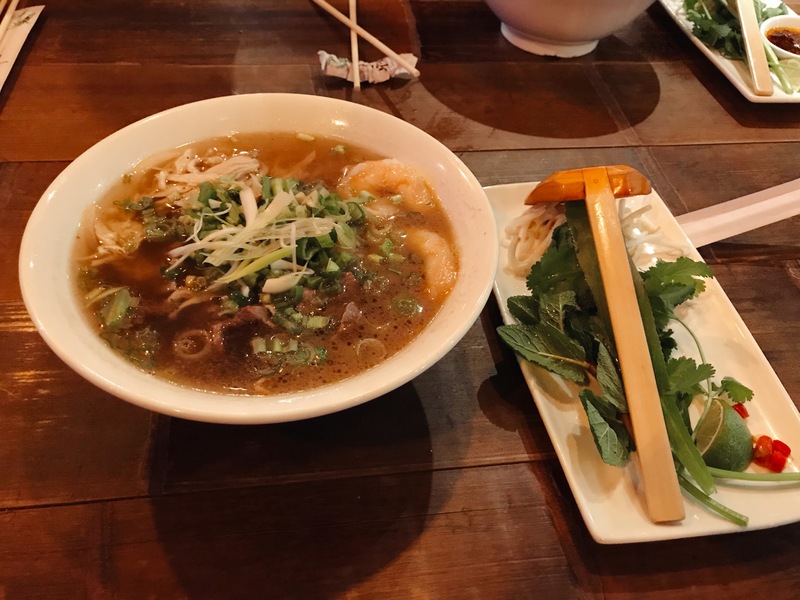 It’s a pity, because there is a lot to like about Pho: the room is great, the menu is excellent for vegetarians, vegans and people who choose to eat gluten free, but none of that matters if the food doesn’t hit the spot. Perhaps if they did banh mi – the other great dish of Vietnam and one sadly not represented on the menu – I would go back one lunchtime to try it. 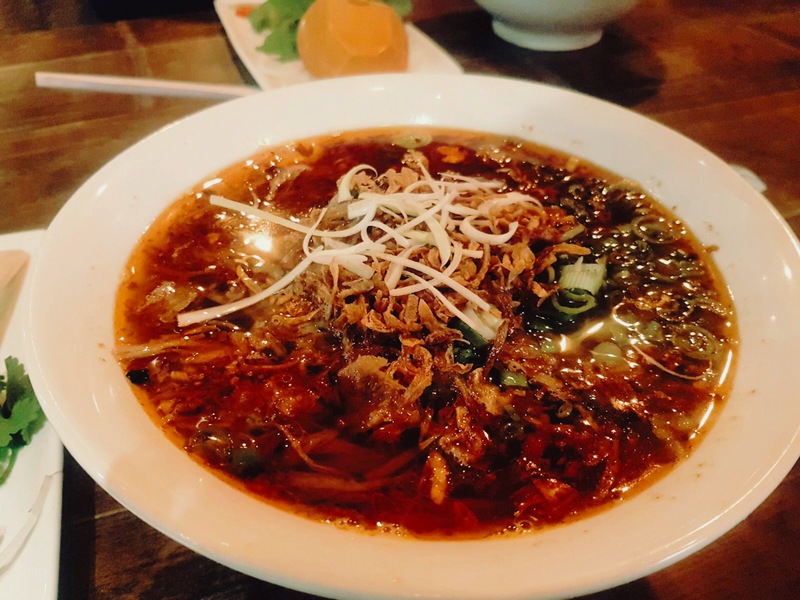 But as it was I just couldn’t see myself picking Pho over one its local rivals, whether that was Royal Tandoori for heat, Namaste Kitchen for noodles or Honest for quick, simple casual dining. So, not a quirky review this week but instead one of quiet disappointment: the gap between inoffensive and offensive is admittedly much bigger than the fine line between subtle and bland, but it doesn’t bode well when inoffensive is the best you can do. I had also had Vietnamese once before, in one of those ludicrously small restaurant in Crystal Palace whose name has escaped me, and it also blew me away. I was similarly dissapointed by Pho. I did love the Ca-ri, but everything else that I or anyone else had (we did quite a bit of cross-sampling) struck me as uninspiring. I was lucky enough to have picked the Ca-ri as my main, so did end up having a reasonably nice meal, and, if I had to go there again for some reason, I’d be able to have an enjoyable meal. However, I wouldn’t go back to anything else I tasted that night (Summer Rolls, a few other starters I don’t remember, and plenty of variety on the Pho theme), and that hasn’t made me that interested in branching out to the rest of the menu away from my lucky Ca-ri find. I order the same thing every time I go to Nando’s, I guess, which is sort of fine, but I also suppose I’m holding Pho to a different standard. Also Pho doesn’t have perinaise so there’s that.